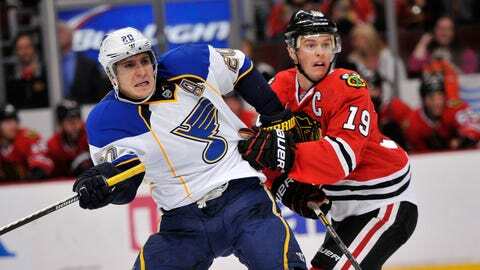 Alexander Steen and the Blues were roughed up by the Blackhawks in Chicago on Wednesday night. The St. Louis Blues have dominated their Central Division opponents this season, but that came to a crashing halt Wednesday night in Chicago. The host Blackhawks, winless in the first three meetings this season, dominated the Note from start to finish and handed them a 4-0 defeat to snap a pair of impressive streaks. NHL-leading St. Louis (47-15-7, 101 points in 69 games) had been 20-0-2 against Central Division opponents this season, earning a point in 22 consecutive contests. The Blues, winners of three straight, had also earned points in nine straight games before Wednesday night. Chicago (40-15-15, 95 points in 70 games) took care of those streaks with a thorough dismantling of St. Louis, scoring once in each of the first two periods before striking twice in the third. It was a night where most everything that could have gone wrong did go wrong for the Blues, and this certainly wasn’t the way they wanted to begin a four-game road trip that continues with a trip to Pennsylvania. Ryan Miller’s first Blues-Blackhawks game was memorable all right, just for all the wrong reasons. The new Blues goalie entered the game with a 7-0-1 mark with his new team, having allowed two or fewer goals in seven of eight starts. Miller stopped 10 of 11 shots in each of the first two periods, but allowed two goals on just five shots in the third and was pulled from the game for Brian Elliott. This loss isn’t all on Miller, of course, as he didn’t get a lot of help. St. Louis allowed Chicago way too many clean looks at the net and wasn’t able to clear pucks in front of the net on the Blackhawks’ final two tallies. Wednesday’s loss was the third time the Blues have been shut out in 12 games since the Olympic break. St. Louis has averaged 20.3 shots on goal in those three defeats. The Blues struggled to generate decent scoring chances against the Blackhawks and failed to capitalize on the few they had. Chicago set the tone for the night by outshooting St. Louis 11-8 in the first period and 11-6 in the second. The Blues didn’t register a shot on goal until nearly 8 minutes into the second period, a sure sign that the visitors were in for a long night in the Windy City. The St. Louis power-play units had been better as of late, with three goals in its previous five games, but they failed to convert on three power-play opportunities Wednesday. The Blues only had three shots on goal with the man advantage. The Blackhawks made the most of their three power-play chances, scoring twice on two shots. The Blues had been strong on the penalty kill lately, too, allowing just one goal on 19 opponents’ power plays over their previous seven games. St. Louis entered the night ranking second in the NHL in penalty kill percentage at 86.3, trailing only the New Jersey Devils (87.2). The last time the Blues allowed two or more power-play goals in a game was when they surrendered three in that ugly 7-1 loss in New Jersey on Jan. 21.